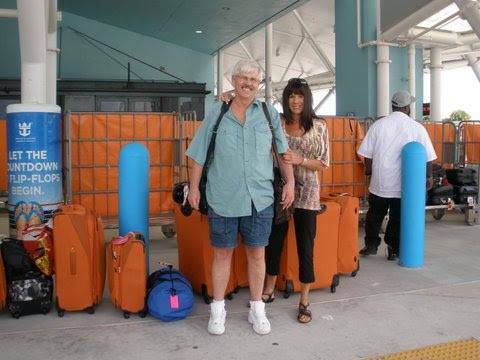 Look at all that luggage we had back in January 2013 as we prepared to board our second cruise in Fort Lauderdale. We still can't believe we had 17 pieces and are now down to three checked bags and two carry-ons. Thank goodness, we lightened our load! Tom still has that shirt which after all our recent purchases is headed into the pile we're accumulating for Goodwill. That shirt and those capris wore out a few years ago and in the past few weeks, I tossed those sandals, that had finally "bit the dust." It's hard to believe that the newspaper article about our world travels was published on January 3, 2013, four and a half years ago. As we reread through this article we're reminded of how much we've learned and grown these past years of traveling the world. Please click this link for the story published in the Southwest News Media, that publishes many of the local suburban newspapers. When the story was published on the above date we had boarded our first cruise from San Diego, California through the Panama Canal, ending in Fort Lauderdale, Florida where after two nights, we were on our way to our first vacation/holiday home awaiting us in Placencia Belize, our first home outside the US. When we left Minnesota on October 31, 2012, we headed to Scottsdale Arizona for an off and on two-month stay in a vacation condo, fully equipped for our needs. It was during this period that we traveled back and forth to Nevada, visiting family and taking "care of business" we'd yet to complete. When we look back we realize it would have made more sense to stay in Nevada during the two months of final preparations. However, at the time, we wanted to see if Scottsdale Arizona was a place we might eventually settle when our traveling ended. Arizona was lovely in many ways but not our cup of tea. As we've continued in our travels, we've now dismissed the concept of "living anywhere" when this nomadic lifestyle is everything we need. Tom's sisters have second homes in Apache Junction Arizona and we relished in the idea of being nearby to visit them at our leisure during this period. With eldest son Richard living in Henderson Nevada and my eldest sister living in Las Vegas, we found ourselves driving back and forth to Nevada on several occasions to ensure we'd see everyone before departing the USA. As it turned out, we rented an additional vacation home in Henderson for a week during Christmas when three of Tom's sisters and two husbands stayed with us during the holiday. It was during this period that we also had an opportunity to see my cousin from Boston and her two adult daughters who also happened to be in Las Vegas for Christmas. Back in Arizona, we purchased new laptops, unlocked phones and other digital equipment for our upcoming travels. We handled financial matters, setting up appropriate accounts that would facilitate our travels. We finalized details for international health insurance. We created an entirely online lifestyle that didn't include receiving much snail mail through our already established mailing service in Nevada. By the time we wrapped up our time in Arizona and Nevada, we made our final US road trip to San Diego to board the Celebrity Century. On January 3, 2013, we sailed away. Today, we met with the same reporter, Unsie Zuege with whom we communicated for the Minnesota news article almost five years ago. During these years, with our accumulating rich and fulfilling experiences so much has changed for us. Today, when Unsie arrived at our hotel at 9:00 am to interview us, we were surprised to know that she, too, like many worldwide readers have followed along with us over these years. How fortunate we are to build these special relationships with people we meet along the way and those we joyfully gather in our travels. After an action packed three hours with Unsie, we sadly ended our time together. She took photos and a video while gathering tons of pertinent facts from us while fast and furiously documenting our answers to her seemingly endless flow of thought-provoking questions. We couldn't have enjoyed her more and the opportunity to reach even more readers after the story is published in a few weeks. Once the story is online and in print, we'll post it, along with the photos and videos right for all of our readers. Please check back. Now, close to 1:00 pm, I'm terribly late in posting today's story. Soon, I'm leaving for afternoon tea with friend Chere at a restaurant in nearby Edina. No doubt, this will be the continuation of a pleasant and relaxing afternoon to supplement this already delightful day. Tom and I can't stop smiling over the opportunity we had this morning to consolidate our years of world travel into one fell swoop, sharing it with Unsie. It reminded us of how grateful and appreciative we both are for the range of experiences we've had so far, along with that which is yet to come. One week from today we'll be leaving Minnesota and on to our next leg in the US visit..three weeks in Henderson/Las Vegas Nevada. Perhaps, we'll get into a little of the touristy type stuff to share with you here! Tom ate a few of these "wienie wraps" in Singapore. These are SGD $1, US $.74. He'd expected them to taste similar to the US version of a wienie wrap but said they weren't quite the same. For more photos, please click here.